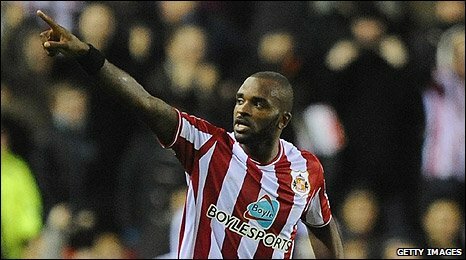 Darren Bent scored the winner as Sunderland became the first team not to concede against Arsenal this season. The Black Cats were stretched early on, particularly when Alex Song exchanged passes with Eduardo, who then scooped his shot wide of the target. Steed Malbranque had two good chances for the hosts but his inaccurate shooting let Arsenal off the hook. But Bent struck the only goal when he slotted in the rebound after his header came back to him off Frazier Campbell. The goal itself was a touch fortunate but the hosts deserved their first win in five games after producing a solid performance to end Arsenal's 14-match unbeaten run. For the Gunners the result will be damaging as title rivals Chelsea won, while Manchester United moved up to second place, three points above Arsenal, after beating Everton in Saturday's late kick-off. The visitors were clearly affected by the absence of injured forward Robin van Persie, who will hope his horse placenta treatment gets him back to fitness well inside the estimated six weeks. In the place of the Dutchman, Eduardo led the Gunners' line and the Croatian created an early chance for Tomas Rosicky, who forced a fine save from Marton Fulop. Eduardo then had a chance of his own after he exchanged passes with Song, but he could not quite get the ball out from under his feet and scooped the ball wide. At that time Sunderland looked shaky at the back, central defender John Mensah particularly struggling to find his form. His partnership with Paulo da Silva was a first for Sunderland, who were without the suspended Michael Turner, and it looked raw and vulnerable. In contrast, Arsenal's ever-present central back pairing of Thomas Vermaelen and William Gallas - who was booed by the home fans for his part in France's 'handball' goal against Ireland in midweek - looked solid. Until, that is, Arsenal were caught by a counter-attack and Malbranque almost opened the scoring with a volley that fizzed over. The Frenchman was similarly placed moments later when he collected Andy Reid's long cross but he blazed his shot well off target. Earlier, Cesc Fabregas had struck a shot just over the angle of the post and bar but the Spaniard was not at his imperious best. After the break Reid did his best to up the tempo for the hosts - as he had threatened to do in the first 45 minutes - and he sent a free-kick skidding wide. Shortly after, the midfielder smashed a shot high and wide after the ball bounced into his path via an Arsenal leg. If that was a warning for Arsenal, it was one they did not heed as another Reid cross - this time from a corner - caught them cold. Bent rose highest and his header ricocheted back to him off Campbell, leaving the striker a fairly simple task to slot the ball in. Neither side had regularly threatened before then, and Arsenal had already attempted to address the issue by bringing on Andrey Arshavin for Aaron Ramsey. And they immediately responded to going a goal behind by replacing Eduardo and Rosicky with Theo Walcott and Carlos Vela. Despite all their offensive options, Arsenal struggled to carve out any clear chances. The closest was when Fabregas slid in but could not connect to a low cross and, later, when Arshavin narrowly failed to turn the ball in at the far post. In the closing moments, substitute Vela fell in the box but there was little realistic hope of a penalty. 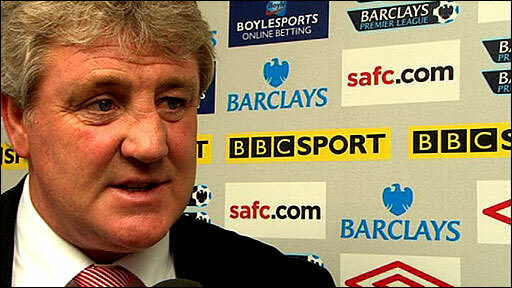 And for the first time in 12 league meetings between the sides, Sunderland took all three points. "It's nice to beat Arsenal because they are such a good team. "We had a game plan to match them in the middle of the park and the lads ran a million miles in order to do that. "We played very well and we are delighted. It was the manner of it - it wasn't lucky as I can't remember them carving us up. I think we deserved it." 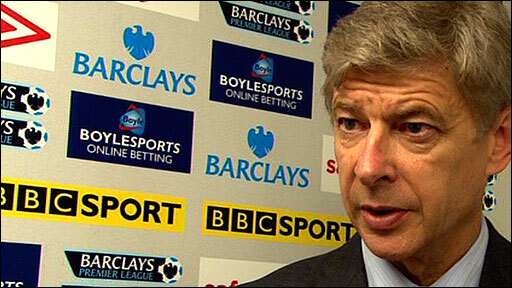 "It was very harsh to lose the game because Sunderland did not create a lot. But we did not create enough chances either and there was a lack of penetration. "They were organised and defended very well and we lacked the sharpness to make a difference. In some positions we were not strong enough. "It is a massive setback because you need consistency to win a title. And today we were not capable of doing that and it raises question marks." 90:00+4:38 The referee blows his whistle to end the game. 90:00+2:38 Free kick taken by Phillip Bardsley. 90:00+2:38 Booking Armand Traore is shown a yellow card. 90:00+2:27 Armand Traore gives away a free kick for an unfair challenge on Fraizer Campbell. 90:00+1:27 Direct free kick taken by Manuel Almunia. 90:00+1:27 Booking The referee cautions Kieran Richardson for unsporting behaviour. 90:00+1:21 Free kick awarded for a foul by Kieran Richardson on Armand Traore. 90:00+0:15 Armand Traore handles the ball and concedes a free kick. Phillip Bardsley restarts play with the free kick. 89:10 Boudewijn Zenden produces a cross, Armand Traore makes a clearance. 86:50 Carlos Alberto Vela produces a cross. 85:58 A cross is delivered by Alexandre Song Billong, Andrey Arshavin has an effort at goal from close in which goes wide right of the goal. 84:53 Corner taken by Francesc Fabregas played to the near post, clearance by Darren Bent. 84:47 The ball is sent over by Theo Walcott, Anton Ferdinand makes a clearance. 83:02 The free kick is swung in right-footed by Francesc Fabregas, clearance made by George McCartney. 83:02 Booking Phillip Bardsley goes into the book. 82:51 Unfair challenge on Andrey Arshavin by Phillip Bardsley results in a free kick. 82:32 Foul by Boudewijn Zenden on Alexandre Song Billong, free kick awarded. Samir Nasri restarts play with the free kick. 81:19 Substitution (Sunderland) makes a substitution, with Anton Ferdinand coming on for John Mensah. 81:09 Boudewijn Zenden crosses the ball. 79:34 Unfair challenge on Jordan Henderson by Carlos Alberto Vela results in a free kick. Direct free kick taken by Paulo Da Silva. 78:48 Theo Walcott produces a cross. 78:35 The ball is sent over by Andrey Arshavin, clearance by Jordan Henderson. 78:23 Short corner worked by Francesc Fabregas. 76:47 Marton Fulop takes the indirect free kick. 76:47 Substitution Boudewijn Zenden on for Andy Reid. 76:47 The official flags Theo Walcott offside. 75:43 Corner taken short by Francesc Fabregas. 73:18 A cross is delivered by Francesc Fabregas, Effort on goal by Thomas Vermaelen from inside the area goes harmlessly over the bar. 72:20 Corner taken by Francesc Fabregas from the right by-line. 72:02 Francesc Fabregas takes a outswinging corner to the near post, Darren Bent manages to make a clearance. 71:37 Substitution Carlos Alberto Vela on for Da Silva Eduardo. 71:37 Substitution Theo Walcott joins the action as a substitute, replacing Tomas Rosicky. 70:28 Assist on the goal came from Fraizer Campbell. 70:28 GOAL - Darren Bent:Sunderland 1 - 0 Arsenal Darren Bent finds the back of the net with a goal from inside the six-yard box high into the middle of the goal. Sunderland 1-0 Arsenal. 69:16 The ball is delivered by George McCartney, save by Manuel Almunia. 68:19 Free kick awarded for an unfair challenge on Lorik Cana by Samir Nasri. Marton Fulop takes the free kick. 68:07 Lorik Cana concedes a free kick for a foul on Francesc Fabregas. Francesc Fabregas takes the free kick. 65:06 Substitution (Sunderland) makes a substitution, with Fraizer Campbell coming on for Steed Malbranque. 64:22 The ball is crossed by Armand Traore, clearance made by John Mensah. 61:38 The ball is crossed by Andrey Arshavin, Steed Malbranque makes a clearance. 59:50 The official flags Darren Bent offside. Manuel Almunia takes the free kick. 59:07 Substitution Andrey Arshavin comes on in place of Aaron Ramsey. 58:56 Andy Reid produces a left-footed shot from the edge of the area and misses to the left of the goal. 58:12 Shot by Samir Nasri from 20 yards. Paulo Da Silva gets a block in. 56:26 Unfair challenge on Lorik Cana by Alexandre Song Billong results in a free kick. Andy Reid produces a shot on goal direct from the free kick. 54:35 Andy Reid produces a cross. 53:10 Da Silva Eduardo fouled by Paulo Da Silva, the ref awards a free kick. Francesc Fabregas takes the free kick. 49:27 Bacary Sagna crosses the ball, Paulo Da Silva manages to make a clearance. 48:02 Samir Nasri fouled by George McCartney, the ref awards a free kick. Bacary Sagna crosses the ball in from the free kick, Lorik Cana makes a clearance. 47:31 Free kick awarded for a foul by Kieran Richardson on Francesc Fabregas. Francesc Fabregas restarts play with the free kick. 45:22 Da Silva Eduardo gives away a free kick for an unfair challenge on John Mensah. Direct free kick taken by Marton Fulop. 45:00+1:16 The players leave the pitch at half time. 45:00+0:51 Francesc Fabregas has a shot on goal from outside the area which misses right. 45:00+0:35 A cross is delivered by Aaron Ramsey, clearance by Paulo Da Silva. 45:00+0:12 Kieran Richardson crosses the ball, save made by Manuel Almunia. 43:34 Tomas Rosicky concedes a free kick for a foul on Steed Malbranque. Andy Reid delivers the ball from the free kick left-footed from right wing. 41:30 Bacary Sagna fouled by Darren Bent, the ref awards a free kick. Direct free kick taken by Francesc Fabregas. 39:21 The ball is crossed by Steed Malbranque, Bacary Sagna makes a clearance. 38:45 Unfair challenge on Lorik Cana by Aaron Ramsey results in a free kick. Marton Fulop restarts play with the free kick. 38:12 The official flags Darren Bent offside. Free kick taken by Manuel Almunia. 37:41 Aaron Ramsey takes a shot. Save by Marton Fulop. 31:46 Da Silva Eduardo has an effort at goal from deep inside the area missing to the left of the target. 27:53 Samir Nasri concedes a free kick for a foul on Phillip Bardsley. The free kick is delivered left-footed by Andy Reid from right channel, clearance by Alexandre Song Billong. 25:18 A cross is delivered by Da Silva Eduardo. 22:09 Steed Malbranque crosses the ball, clearance made by Bacary Sagna. 21:45 Samir Nasri produces a cross, clearance by Lorik Cana. 21:01 The referee blows for offside against Darren Bent. Free kick taken by Thomas Vermaelen. 20:15 Corner taken left-footed by Andy Reid, save made by Manuel Almunia. 18:15 The ball is crossed by Andy Reid, Shot on goal by Steed Malbranque from inside the box goes harmlessly over the target. 15:46 Effort from deep inside the area by Steed Malbranque misses to the right of the target. 14:48 Unfair challenge on Jordan Henderson by Alexandre Song Billong results in a free kick. Phillip Bardsley restarts play with the free kick. 12:36 Effort on goal by Francesc Fabregas from outside the penalty box goes harmlessly over the bar. 9:29 The ball is swung over by Armand Traore. 8:59 Foul by Steed Malbranque on Alexandre Song Billong, free kick awarded. Aaron Ramsey takes the direct free kick. 7:59 Francesc Fabregas challenges Andy Reid unfairly and gives away a free kick. Free kick taken by John Mensah. 7:12 The ball is swung over by Samir Nasri, Marton Fulop makes a save. 6:38 Lorik Cana challenges Francesc Fabregas unfairly and gives away a free kick. Francesc Fabregas takes the free kick. 5:14 Francesc Fabregas takes a short corner, Francesc Fabregas produces a right-footed shot from just outside the box that misses to the right of the target. 5:00 Tomas Rosicky takes a shot. Save by Marton Fulop. 4:52 A cross is delivered by Bacary Sagna.